Dollar Strength Smacks Metals; 2017 Market Crash? Coming up we’ll hear from Michael Pento of Pento Portfolio Strategies and author of the book The Coming Bond Market Collapse: How to Survive the Demise of the U.S. Debt Market. Michael tells us whether or not the correction in metals is going to last much longer. He also makes a couple predictions about a Donald Trump presidency and the breaks down what he sees as the most likely scenario when it comes to inflation and interest rates. 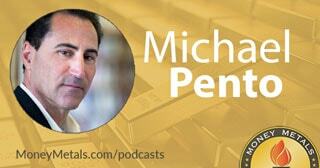 Make sure you stick around for a fantastic interview with Michael Pento, coming up after this week’s market update. An upside breakout in the U.S. dollar is making for another rough week in the gold and silver markets. On Thursday, the Dollar Index hit a 13-year high. Traders are bidding up Greenbacks on account of rising U.S. interest rates. The yield on the 30-year Treasury bond has surged from an historic low of 2.1% in July all the way up to 3% in the past few days. Rates on short term bonds had held steady through October, but they are now also starting to rise. For the first time this year, the bond market is telegraphing a near certain rate hike by the Fed at its next meeting. That meeting will take place on December 13th – 14th. In the meantime, a stronger dollar will continue to be a headwind for precious metals markets. As of this Friday recording, gold shows a weekly loss of 1.8% to bring spot prices to $1,208 an ounce. Silver prices are down nearly a dollar or 5.3% to trade at $16.56 per ounce. And platinum is off 2.8% this week to trade at $921. The lone bright spot in the metals space – and for the second week in a row now – has been palladium. It often bucks the general trend in precious metals markets and is doing so in a big way this week. Palladium prices actually surged to a new high for the year on Thursday. As of Friday, palladium registers a 5.9% advance for the week, on the heels of a 7.6% gain last week, and now trades at $719 an ounce. We’ve talked about the value of palladium as a portfolio diversifier before. Most metals investors remain underexposed to palladium, which is used in auto catalysts and is now in short supply. The palladium market will finish the year with a supply deficit of around 650,000 ounces. It will experience a similar shortfall in 2017 if forecasts for rising automotive demand prove out. The silver market is also coming in at a deficit this year, with 52 million more ounces consumed than produced. The deficit would have been even larger if not for a drop off in demand during the second half of 2016. Silver mining output is now also on the decline, reversing a multi-year expansionary trend. So even a small uptick in demand next year could widen the supply deficit and put significant upward pressure on prices. Of course, any deficits in metals markets will be dwarfed by the one in Washington. The 2017 fiscal year started 46 days ago, and in the short time since, another $295 billion has been added to the national debt. By the time Donald Trump is sworn in as president, the total national debt will exceed $20 trillion. Given his promises to not touch entitlements, to rebuild the military, and to spend big on infrastructure, there is no reason to expect the budget deficits to close. The only thing Trump might be able to do is make the debt more manageable by growing the economy. The problem with that is, if he does achieve higher rates of GDP growth, then higher inflation and higher interest rates could be the side effects. Coming off of record low long-term rates in 2016, the government’s debt servicing costs could soar next year and beyond if interest rates continue rising. Right now, the threat of rising rates has traders punishing the gold and silver markets. But in the months ahead, the perceived threat could shift to that of inflation and the Fed being behind the curve. Precious metals tend to thrive in that sort of environment. When inflation outpaces rate increases, then rates are trending in a negative direction in real terms. Negative real interest rates are bullish for hard assets, regardless of whether nominal rates are heading up or down. That’s the big picture for precious metals. Even though it doesn’t look pretty right now given the selloff of the past two months, gold and silver markets will find a bottom if they haven’t already put one in. Well now for more on the post-election market reaction, what’s ahead for the all important bond market and a key outlook on precious metals in the months and years ahead, let’s get right to this week’s exclusive interview. Mike Gleason: It is my privilege now to welcome in Michael Pento, president and founder of Pento Portfolio Strategies and author of the book The Coming Bond Market Collapse: How to Survive the Demise of the U.S. Debt Market. Michael is a money manager who ascribes to the Austrian School of Economics and has been a regular guest on CNBC, Bloomberg, Fox Business News, and also the Money Metals Podcast. Michael, it's always great to have you on. Thanks for joining us today and welcome back. Michael Pento: The best of all that list is the Money Metals Exchange. How's that, Mike? Mike Gleason: Well, thank you very much, again, for being generous with your time. Before we go any further, I would be remiss if we didn't get your thoughts on what we saw with the presidential election. Trump defied the odds and managed to upset the establishment, similar setup to what we saw with Brexit with most pollsters completely missing the boat. They were calling for the mainstream political establishment to come away with the win, only to find out that the other side was pretty worked up and came out to vote in droves. Was it all that surprising that Trump rode a similar wave of dissatisfaction for the status quo to victory? What did you make of how it all played on in the end, Michael? Michael Pento: It was surprising to the liberal corrupt media, but it wasn't all that surprising to me. If you look at the fact that Americans haven't had a real increase in wages and salaries for decades; if you look at the fact that the stock market hasn't gone really anywhere since QE3 ended in October of 2014 in real terms; if you look at the fact that the economy can't grow any faster than 2%; if you look at the fact that going back eight years you haven't gotten any money when you put your deposits in the banking system… if you look at all those factors, it's not surprising at all that an outsider who wants to drain the swamp would be elected president of the United States. Mike Gleason: Now turning to the fallout in the financial world, what has the market reaction since the election said to you because many were calling for a major pullback in the equities markets if we got a Trump victory and it was heading that way election night, but the markets have since drastically reversed course. What are we to make of all that? Michael Pento: I was short the market going into the election. I was short high yield. I was short emerging markets. I was short, a little bit short domestic markets. I was happy when the market was lock limit down. I think the Dow was down 800 points in the wee small hours of November 9th. And by the time I covered my shorts, I hardly made any money. It was a Republican sweep that was not predicted by much of anybody. I guess gridlock was mostly predicted, but now what the people are thinking was let's see, Donald Trump could be a little more friendly to businesses. He could reduce taxes. He could reduce regulations. By the way, complete candor, I did vote for Donald Trump, but I didn't do so enthusiastically. I thought he'd be a far better president than Mrs. Clinton, but I also have some problems with Donald Trump and it would be remiss for me not to also tell you that I think Donald Trump is very inflationary and I think he might be in the process of popping the 35-year-old bond bubble. Mike Gleason: There is a lot of optimism around some of Trump's big proposals that you were referring to there, the tax cuts, infrastructure spending, cutting regulations, some are suddenly now expecting an economic renaissance akin to the one that occurred under Ronald Reagan, but there are lots of real differences in the landscape today versus 36 years ago. For example, U.S. debt is over 100% of GDP. It was only about 30% back then. Individuals are also drowning in debt. From top to bottom America just is not in a good position to borrow and spend our way into an economic boom, but hey, if we get lower taxes and less bureaucracy, if Trump can deliver it great. But what are your thoughts? Is it a good time to get optimistic and invest accordingly? Michael Pento: I have to say no. I don't think I am overly optimistic right now. Let's just go through some facts and you touched on how over-indebted we are. As a nation if you look at total non-financial debt we are at an all-time record high. It's 230% of GDP, total non-financial debt. The country just cannot afford to go through a massive collapse in bond prices. I'm talking about not rates going to 18%. Even if they go back sort of close to normal, the normal yield on the 10-year note is 7% going back to 1949. So if you look at that average, suppose we go back to 4%, even 5% on the 10-year note, what's that going to do to the housing market? What's that going to do to every individual who was sequestered in bond proxies for the past eight years? You are going to collapse the entire stock market. You are going to collapse the real estate market and by definition, you are collapsing the bond market. Mr. Trump is going to add to that collapse because he has huge deficit spending plans and that's a huge increase in the supply of treasuries. He’s also – and this is what I hear from the members of the FOMC – that a Trump presidency suddenly means they are going to be more aggressive with their rate hike campaign. It's going to be an accelerated campaign. Now what happens if you have huge deficits, the deficits by the way are already up 34% year over year, now you have $1 trillion spending plan over the next 10 years. The Fed is more aggressively hiking rates, which means they are beginning to sell. In order to hike rates you have to sell assets, so they are going to start to train their $4.5 trillion balance sheet and by raising short-term interest rates, much more supply. Who is going to buy it? The Chinese are not buying them anymore. It's a very, very bad situation that I think short term exists for the bond market. And if I'm right, by the way, the 10-year note’s yield went from 1.83% the night before the election to 2.3% in the wake just a few days after the election. Now if that kind of trend even remotely continues, Mr. Trump unfortunately is going to be welcomed in as so many other of his predecessors with a recession and maybe a very steep one. There has not been one dollar of taxes that have been cut. There has not been one dollar spent on deficits. One shovel has yet to be bought for a shovel-ready project. All these things are yet to come, but what we do have now is mortgage applications, which are absolutely collapsing. I know we saw today was a huge increase in the number of home starts, especially on the single-family home front. My point is if you are adding greatly to the supply of homes and yet mortgage applications are plunging and home sales are plunging, what is that going to do for the massively over-valued and record high real estate prices that exist in many sections of the country? So I’m optimistic. I'm hopeful in the long run regarding Donald Trump, but my big problem here is I don't think with the massive amount of debt we have outstanding that we can actually start to see rates rise, undergo a collapse in the bond market and suddenly the stock market is going to love that. I don't buy it. I'm just a little bit cautious for now. Mike Gleason: Trump has been all over the map with his stance on Janet Yellen and the Fed. First he said he was a low interest rate guy, saying he and Janet Yellen shared some common ground on that. Then a few months back he became critical of her and accused the Fed of being too political. And now that he has been elected he seems to have softened a bit and doesn't appear he is terribly interested in rocking the boat there. So my question is do we really have any clue as to what kind of monetary policy we will see under a Trump presidency? There are many who believe we will just have massive money printing to fund major infrastructure spending and so forth, what do you think Michael? Michael Pento: Well, you are so correct, Mike, a very good job on your part. So candidate Trump accused the Fed of “being political.” I guess Mr. Trump, he wanted to become president, so what he would have liked to have seen is an aggressive Janet Yellen raising interest rates, throwing the economy into a recession and that would hand him the presidency. But now that he has ascended to the president-elect stature, he has taken a step back. I don't know if he is going to let Janet Yellen run out her tenure until February 2018. What if he was to supplant her with John Taylor with his Taylor Rule, which he is saying would increase rates dramatically very, very quickly according to the Taylor rule? There are a lot of things we are not quite sure of. We do know this though. This is very clear throughout history. If you have a country that has a debt to GDP, which is well over 100%, if deficits are rising to 3%, 4%, 5% of GDP and you have huge plans to increase those deficits … and by the way, I am going to add this… he’s also a proponent of trade wars, which would add to the import prices and also increase domestic inflation. So it's more pressure on the bond market. If you are going to have all those things in place, you are going to have to have a very, and history shows this clearly, you have to have a very accommodative central bank, one that is purchasing government debt, one that keeps interest rates well below nominal rates. Real interest rates have to be well into the negative category. You certainly cannot have all those things I mentioned and even a moderately aggressive central bank that is draining its balance sheets, selling assets into that structure. You are talking about a collapse in bonds that we have not seen ever before. And what that does to this record amount of debt and these record level of asset bubbles I think you can imagine is not going to be very good. Mike Gleason: Precious metals bulls have been on the run since the election. Most expected Donald Trump's victory would be good news for prices, but it hasn’t been so far now. Speculative longs are getting out of the futures markets and we are going to need to find some reason for that crowd to start buying again. Looking ahead over the next few months would do you see as some potential catalyst to bring new buyers back into the metals? Michael Pento: Well I think the bull market in gold after the election lasted hours and gold spiked hugely right after the election and then it has been under pressure ever since as you pointed out. Gold has a problem here in the short term and it's obviously been reflected in its price. The dollar is at a 13-year-high, and a rising dollar is not generally very good for the gold price. Rising nominal interest rates as I just mentioned from 1.83% to 2.3% and that's not really for gold. And since you haven't had any inflation yet kick into any increase, you have inflation, but you have not had any rapid increase in the rate of inflation, real rates are also rising. So that's very bad for the gold market in the short term. By the way, let me go on record. I am going to be very clear. I believe we need to normalize interest rates. I am all for the collapse of this phony ersatz debt-disabled and asset bubble-ridden economy. But does Donald Trump have the guts, the temerity to allow a recession/depression to occur to get to the other side of that viable economy? I don't think so, but that remains to be seen. Mike Gleason: Touching on these trade wars here, you wrote about it in your Pentonomics piece this week, which was excellent by the way. You talked about how Trump is going to try to impose these tariffs on imported goods, forcing some of these manufacturers to start making products in America. You alluded to this a moment ago, but talk about that dynamic because products cannot be made as cheaply here as they can in China and that in turn could really spike a lot of inflation, is that fair to say? Michael Pento: Yeah, as I covered before. If you look at Smoot-Hawley, the trade tariffs in 1930, not only are they inflationary, not only do they raise the cost of domestic goods and imported goods, but they are very recessionary. If you slap a tariff on China for their textiles that come into the country, well we don't really have a textile industry here, so you’re looking about shortages. You’re talking about a huge spike in prices and not much good is going to come out of that in the short term. That's going to be one of those catalysts I see for bringing gold and precious metal prices back into a bull market sometime in 2017. Mike Gleason: So bottom line here Michael as we begin to close, give us an idea of what the financial landscape is going to look like the next few months and years in your opinion? What are some of the greatest risks and opportunities and will precious metals still be a viable and important asset to go through it all? Michael Pento: Well, I think so. I think precious metals will be extremely viable and a necessary asset. No matter what happens, you should always have about 10% to 15% of your portfolio in physical gold and precious metal-related assets, be they mining shares or gold stored in your physical possession or in a vault. So let's start from there. But my gut feeling is Donald Trump is not going to get all of the things he wants accomplished and he is going to be more of a status quo (guy) than you think. He might get some tax cuts. He might get a little bit of a better trade infrastructure agreements accomplished. But the bottom line is this, there’s no avoiding the fact that the country – and even the globe as a whole – is in a condition of debt disablement. That's the number one thing I want to stress. If you look at Japan, Japan's debt to GDP is to 230%. They are purchasing 80 trillion yen per year of assets. They have 50% of their ownership in ETF's. They have almost 99% of the market of new issuance of government debt, JGB's. This is the case all over the world. The central banks are controlling through financial repression the cost of money. And if that was to change we are going to have a depression not only in the United States but around the globe. I don't think the Keynesians that still run the IMF and the BIS and all of those organizations are going to allow that to happen. So what I am saying is this. I think free, easy and cheap money is going to be around for a very long time. We have this brief, truncated period where central bankers want to back away from QE. I think it's going to be a disaster and I think the global economy crashes in 2017 and that brings us back to the discussion of helicopter money. And that is where I think we are headed in 2017. It's going to be a very dynamic, very challenging year for investors. You have to stay tuned, pay attention and the static modern portfolio model of investing is dead and gone and that is going to be proven absolutely true in 2017. Mike Gleason: Well excellent stuff, Michael. We always appreciate your insights and thanks for being so generous with your time. We really enjoy your commentaries. And on that note if people want to both read and hear more of those from you and want to follow your work or learn more about your firm and how they could potentially become a client, tell them how they can do all that. Michael Pento: Well, you can call the office directly at 732-772-9500. My website is PentoPort.com and my email directly is [email protected]. I have a great website. There's a podcast there you can subscribe to and we are doing very well here. And I think it's going to be essential to have someone with a dynamic strategy to help you survive in the coming environment. Mike Gleason: Well again great stuff, Michael. Enjoy your Thanksgiving next week and we’ll look forward to catching up with you again as we begin to learn more about what the economic environment is going to look like under this new administration. Thanks again for the time. Michael Pento: Thanks for having me, Mike. Mike Gleason: Well, that will wrap it up for this week. Thanks again to Michael Pento of Pento Portfolio Strategies, for more information visit PentoPort.com. You can sign up for his email list, listen to his mid-week podcasts and get his fantastic market commentaries on a regular basis. Again, just go to PentoPort.com. Until then this has been Mike Gleason with Money Metals Exchange, thanks for listening and have a great weekend everybody.